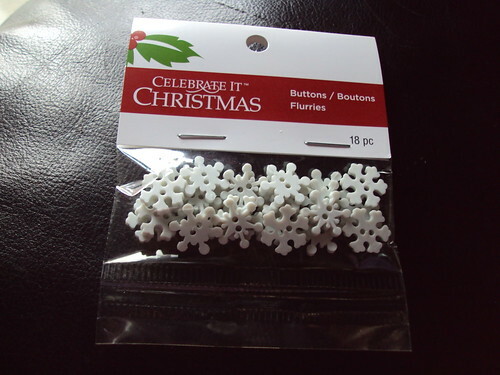 I found the perfect snowflake buttons at Michaels… but they only had one package left. Ug. I picked up a package of mini assorted Christmas buttons (trees, gingerbread men, snowflakes) for the rest. The buttons were on sale for .99/pkg! I ended up with 18 snowflakes and 10 of the assorted. 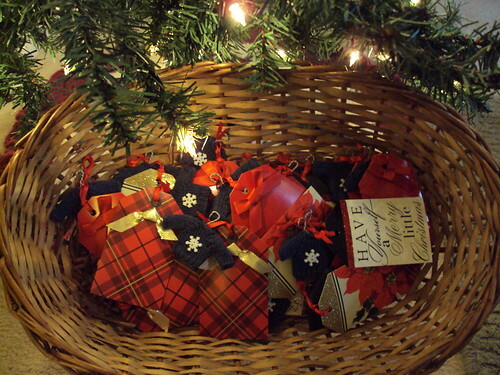 The ornaments were decorated and tagged in two evenings and they turned out SO cute! I love them! For less than $8.50 I made 2 dozen gifts. That’s about 35 cents each! It took about 2 hours from start to finish for each ornament. So happy to have these done with a bit of time to spare! 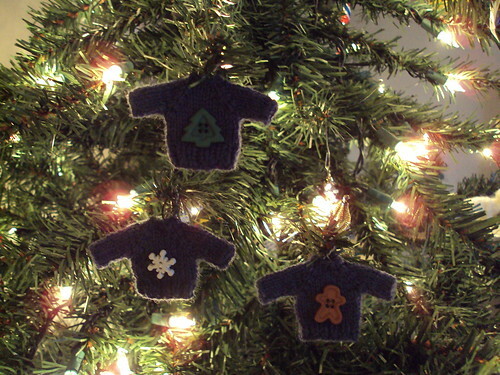 The mini sweaters were knitted up ages ago and got tucked away in my knitting drawer. Last month, I spent a week at my parent’s house (Hubby had some meetings in Philly at the beginning of the week and we house sat the rest of the time). My Dad helped me make a jig for the wire hangers (3 nails hammered into a piece of wood in the triangular shape of a clothes hanger). With the help of his handy dandy safety wiring tool (he was a jet engine mechanic for almost 20 years), I twisted the ends of the wire together and bent it into a question mark for the top. 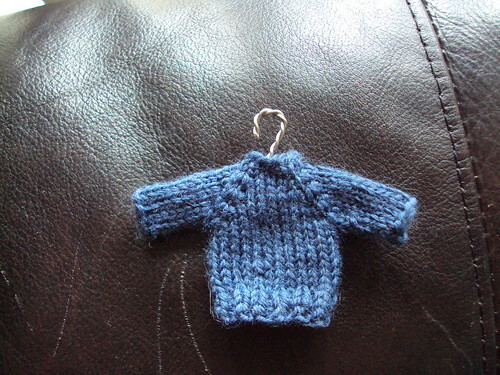 A hanger for my sweater ornament. 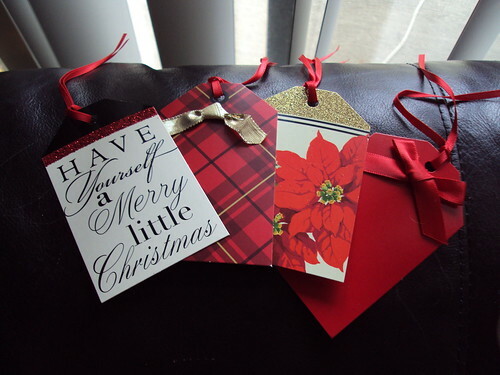 Earlier this month, I found a $5.00 coupon for the Hallmark store in my Martha Stewart Living magazine. Score! 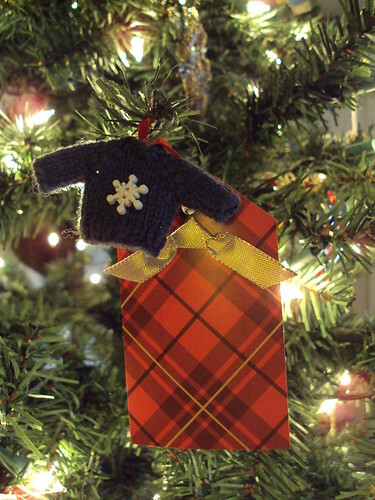 I picked up two 12 packs of gift tags to dress up the sweaters. They were regularly $2.99 each, but with my coupon it only came to $1.40. All that’s left is to find some snowflake beads or sequins to sew on the front. I tried embroidering a design on the sweater, but it took FOREVER and looked mediocre. Bleh. I really, really hope Michael’s has something that will work. 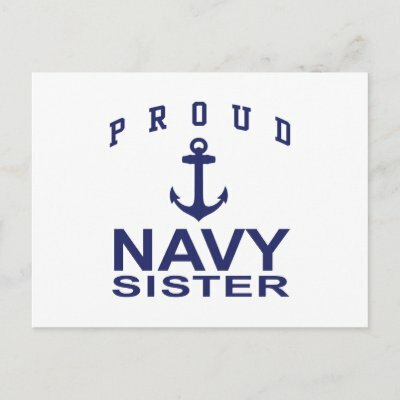 My friend’s wedding is fast approaching (1 month away!) 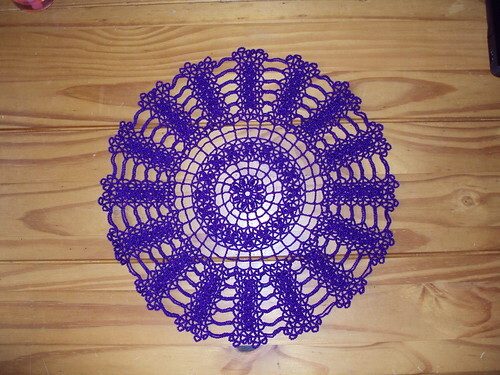 and I’ve completed 5 doilies for her table centerpieces. Only four of them are blocked and I happily handed them over to her at her bridal shower last Saturday. Up until then, I had hid them on top of my china cabinet to keep Bogart the Horrible from getting his paws (and claws) on them. Vintage patterns tend to be a bit vague and poorly written. This one was no exception. It turned out lovely, though. This one was quite time consuming. Towards the end, it was taking me more than an hour to finish each round. I couldn’t wait for it to be over! 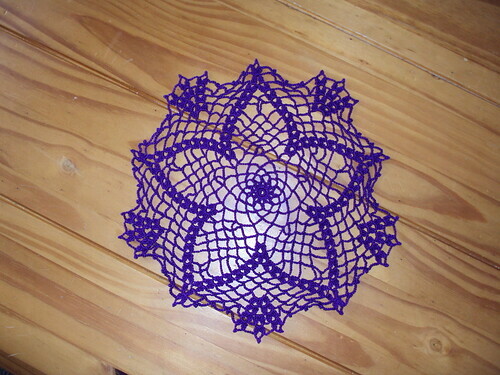 A quick and easy doily that helped me recuperate from the Williamsburg one. An absolute fiasco. 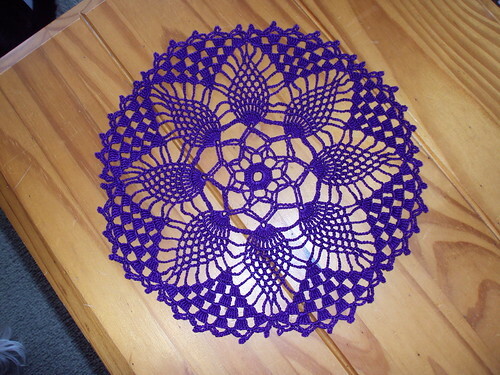 In my haste to finish it, I managed to add a TON of extra stitches somewhere in the middle of the doily. I didn’t realize this until the dratted thing was done and being blocked, so I was forced to block and starch ruffles into it. The “real” pattern is very lovely. Please don’t judge by my sad attempt. 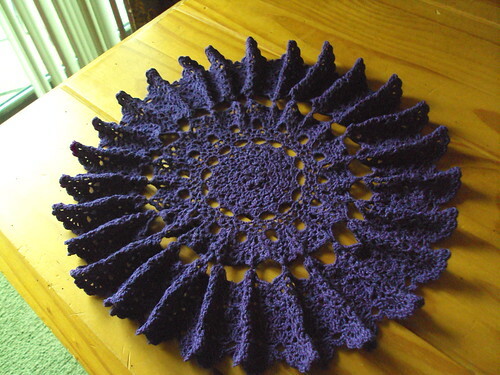 ﻿﻿ Thankfully, my friend isn’t a Bridezilla and said the doily was fine. She went so far as to say the ruffles gave it “oomph”. She’s very kind.